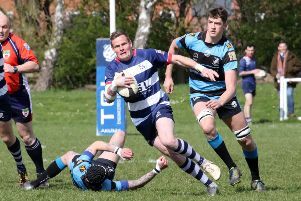 Banbury Bulls head coach Matt Goode has hinted there will be changes ahead of Saturday’s clash with Wadworth 6X South West One East leaders Newbury Blues. Bulls lost for the first time in 22 league outings at Marlborough last weekend and will face Newbury at the DCS Stadium where Goode is hoping home advantage can swing the game in his side’s favour. Sam Stoop and Matt Powell are back in contention but Kallum Dixey and Pete Boulton, who were both injured in the defeat at Marlborough are ruled out, along with Dan Brady. Saturday’s game will also see the home debut of new signing Duncan Reese.